The most demanded song ever on any channel, and that speaks for any medium of music and song over the past four decades, is still voted as that Led Zep composition that hit it off, without even their quite knowing it, Jimmy Page and Robert Plant creating rock history. But that’s not what got me getting to press the good word this time. Just finished attending, Kaislash Kher performing live in Chennai – there’s always a first time. The critics would sidestep him, because his very earthiness struck an instant chord with the hoi polloi, who, unlike the cognoscenti who hesitated, could identify readily with his music, and even more, his voice, spontaneously. He humbly said that he had come to Chennai several times, at the behest of AR Rehman and Harris Jeyaraj, and his sentiment to perform live in this city finally bore fruit today, later than never. To say that he is humility personified would be too trite. He interspersed his every hit, and less well known free-flow, with his own snippets. He said that till 2002, he was but a footloose vagabond unwanted, dog of a tramp, still seeking his forte, and found it that year when he got to finally launch his career. ( nasha, to be precise ) that claims and destroys the person much too fast, and he made a distinction between Fame and Popularity, of which the latter stood him in good stead. And he could not have given a more earthier example: he cited an instance where an avid fan stalked him, cellphone camera live, right into the toilet, and he had to abjure that intrepid aficionado, to wait till they finished their business of nature’s call, and took the snaps for posterity subsequently, relieved. The penultimate number was Allah ke Bandey has dey, to which the entire audience of 2000 was on their feet ( including yours truly ) singing in chorus. Almost a good half were of Punjabi origin, settled in Chennai, and there’s the rub – his down – to – earth rusticity and effervescence, appeals spontaneously to the Punjabi ethos, irrespective of which side of the border of Punjab they hail, though Kailash ji himself is the first to admit, he is a failed businessman from Meerut, and as the stuff of folklore that is always built around legends, has now begun to have it, is only twice-removed from being a bona-fide Kashmiri Pundit. His aside to the galleries, was that he could never manage to satisfy every request for his vocal baritone to belt out their favourite – and the audience was ready to express that disappointment over Facebook the next day, and this pleased him anyway, for everyone likes to be liked, well, wanted. A young lady named Sujata romped on to the stage in a virtuoso dance, bang in the middle of his song. So let me end by expressing my own mild disappointment – the original Amir Khusro beauty, Chhap Tilak sab chheni, missed the repertory for the evening. Apart from the magical lyrics of the great Persian in India, of centuries ago, Kailash ji inflects it with a tinge, enlivens it with an incisive directness that leaves the listener floored. Comparisons are odious, unforgivingly so, when make-believe critics like myself can hardly do justice to such poetry personally, but the brilliant and superlative Abida Parveen ji, whose rendition of the same lyrics I had the privilege of hearing live, here in Chennai, gave the mystic aura of wonder that permeates all Sufi verse, but did not quite knock me off my shoes, and so Kailash should take the floor for this one. Now, to get the wires of my fingers and thought-process well and truly crossed, I duly got my my hair raised and soul stirred, with the lines “Khudi ko buland kar itna ke, har taqdeer pey, Khuda bandey sey puchey bata teri raza kya hai ? “, to which I heard the blithe lines sung by Rahat Fateh ” Tu na jaaney aas-paas hai Khuda “, and of course, Rahat takes the cake for the year, maybe for the entire decade with the lines ” Is umr pey ab, khaogey dhoke, dar lagta hai…..dil to bachha hai ji ” . There’s no disputing that, in any language, in any country, and you know, maybe in every religion ? The men you will see in front of Buckingham Palace, are not just ceremonial guards but also serving soldiers. While upholding the traditions of the past, they also perform duties throughout the world as professional soldiers and are known as some of the most elite and skilled soldiers in the British Army. Soldiers from one of seven regiments will be outside Buckingham Palace, and this dates back to the time of Henry VII (1485-1509). 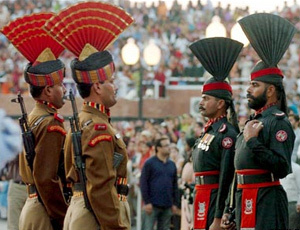 The Grand Evening Ceremony, at the Wagah – Attari border, commenced in 1959, a good twelve years after the two nations acquired independent status, and takes place with the Border Security Force of India, and the Pakistani Rangers, with about 45 minutes of choreographed display, and is a tourist attraction by its own right. One scribe had described it as the “ultimate in cross-border nonsense “. In fact, most people from outside the sub-continent who witnessed this circus, were at a loss to distinguish who’s who, coloured plumes with thumping boots notwithstanding. The good news, for the luckless soldiers performing these stunts, as well as those cogitating on today versus yesterday versus tomorrow, was that last year, the brass on either side actually decided not just to tone down the antics, but considered doing away with it altogether. Bravo ! My Golden Bengal ( Amar Shonar Bangla ) – Pronam !! Now let’s move across a bit, Eastward ho! Have to give this piece of poetry of the Bard of Bengal, and which needs no introduction to any Bengali on either side of the border. But why am I bursting into poetry like your lotus-eater round the corner, today ? Aww, today’s paper actually carries in detail what was mentioned in the news over the past few days, that the Border Security Force is in congenial talks with Border Guards Bangladesh, to have the antics which I have described above, replicated at Petrapole, near Bongaon, and with public approbation, followed by Akhaura and Phoolbani. I don’t doubt for a single second that this asinine idea is NOT going to succeed, will be a still-born non-starter. Neither will it have the goodwill and support of the Bengalis on either side of the border, nor will it attract any numbers to witness the event. The kind of evening circus that’s been put up for over half a century, in the Punjab, will be scorned with derision, from the first display itself, by the Bengali, when displayed close to home.